I-75 South to I-675 South to Exit 3, Davenport/Michigan Avenues M-58. Follow exit road 2 blocks to first streetlight and turn right onto Davenport Avenue (M-58). Follow Davenport Avenue approximately 2 miles. Hotel is on the left. I-75 North to I-675 North to Exit 3, Davenport Avenue M-58. Follow exit (Davenport Ave M-58) straight to hotel, approximately 2 miles. Hotel is on the left. M-46 West to I-75 North to I-675 North. Now follow the South directions above. M-46 East to Midland Road (M-47) North. Turn left to State Street (M-58) East. Turn right and proceed on State Street (M-58) East approximately 3.5 miles. Hotel is on the left. From Washington Ave (M-13) turn onto Ezra Rust Blvd in Saginaw Celebration Square. Follow road (Ezra Rust Blvd/Court St) straight approximately 2.5 miles to State Street (M-58), turn right, hotel is on the left. Use our Ramada Red courtesy telephone to access our FREE Hotel Shuttle Service. It is located on the North wall in the baggage claim area. Or Access MBS ground transportation services, and exit Airport left onto Garfield Rd going South. Proceed to Midland Rd (M-47) and turn left. Take Midland Rd South to State St. (M-58) East. Hotel is about 3 miles on the left. 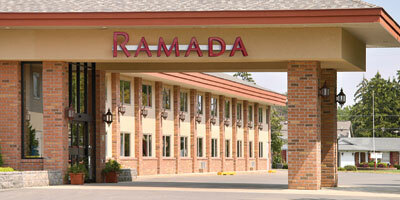 Click here to get directions to the Ramada Saginaw Hotel and Suites via Google Maps.